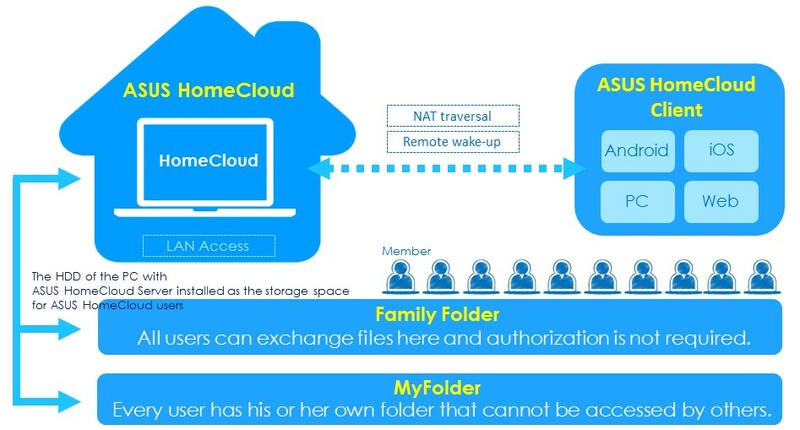 NAT transversal, simply speaking, helps you use handhelds, e.g., smart phones or tablets, when you are on the go to access your network storage device back at home. NAT transversal has complicated setup procedures and NAS, for example, probably first requires you to have a domain name registration on the Dynamic Domain Name Service (DDNS), so that the DDNS can be activated on NAS, where your DDNS account information should also be entered for NAS to update a WAN IP to the DDNS provider. Afterwards, you will have to connect back to NAS by using the registered domain name. This is simply too difficult, if not impossible, for everyday people. ASUS HomeCloud has simplified such complicated procedures for your PC with ASUS HomeCloud downloaded and activated to automatically generate a record of the PC at ASUS Cloud. When you are on the go, you can always connect back to the PC to access data there. Because a record of your PC will be generated in our system after you activate ASUS HomeCloud on the PC, ASUS WebStorage App on your handheld will go to our Wake-on-Wan server to wake up* the PC from sleep mode. Therefore, no matter wherever you are, you can always access your PC on which ASUS HomeCloud is installed. Because Wake on Wan is built-in on ASUS HomeCloud, it will work upon you logging; no extra setting is required. Moreover, the built-in Wake on Wan helps save power for your PC to stay on sleep mode in addition to strengthening the convenience of access. Please come experience for yourself the cloud-based home data storage service; you will learn how to set it up and use it in no time. The thoughtful service lets you use various types of handhelds to access any data on your PC back at home anytime and anywhere. ★ Download ASUS HomeCloud now. * The network interface card of the PC on which ASUS HomeCloud is installed should be able to support Wake on Wan. This is a joke right? It’s not usable. Dear Willie, if you have any question about how to use HomeCloud, please contact our Customer Center: contact@asuswebstorage.com. We will glad to help you solve your problem,thank you. 下一個 下一篇文章： ASUS WebStorage has updated mobile app and web interfaces !